Every industry has “buzz” words that can confuse a family looking for help. Senior home care is no different. Our services can be referred to as: home health care, private duty care, non medical care, custodial care, care attendants, personal care services, etc, etc. It can make your head spin, but what is important for you to know is that you will be receiving quality care with experienced caregivers employed through a legitimate agency. Once you have found a quality care giving company, it’s time to figure out the amount of help and what type of services you need. Our home care intake specialists and client care directors will lead you every step of the way. Directed by our Registered Nurse, we review your specific needs and develop a care plan for you. Our proprietary process helps us determine the services you need and which of our exceptional CNA’s or caregivers will best suit your needs. This brings us to 24 Hour Senior Home Care, and more industry “buzz” words. 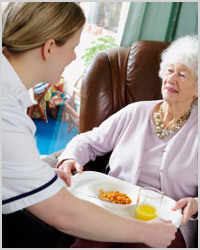 At Affordable Home Care we still offer two types of 24 hour care, where most other companies offer only one option. Our two 24 hour services are Live-In care and 24 hour around the clock care. Live in care gives you the peace of mind that a caregiver is there at night for emergencies or the occasional midnight trip to the bathroom. 24 hour around the clock care offers you caregivers who are alert and at your service all day and all night. When we sit down with you to review your care needs, and if we agree that 24 hours of care is best, we will review the differences between Live In care and 24 hour around the clock care.